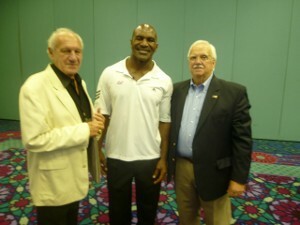 Academy President and CEO Dr. Thomas P. Rosandich (left) with former heavy weight champion Evander Holyfield (center) and Mobile Sports Authority Director Bud Ratliff (right) at the Champions Banquet Aug. 6, in Mobile. The weeklong 2012 U.S. Olympic boxing team trials held in Mobile, Ala., concluded with a USA Boxing delegation touring the United States Sports Academy’s collection of boxing paintings and the Champions Banquet. Before the banquet featuring former Olympian and Heavyweight Champion Evander Holyfield, the Academy showcased its major collection of boxing paintings primarily done by 1993 Sport Artist of the Year Stephen Holland. Holland did an original of Holyfield that is displayed in the Academy’s American Sport Art Museum and Archives (ASAMA). The collection also features a very unique painting of Muhammad Ali signed by him as the same, as well as Cassius Clay. This painting depicts Ali’s final round during the 1960 Summer Olympics in Rome. In addition, USA boxing members toured the Academy’s Human Performance Laboratories that are used for health and fitness evaluations among other things. In the past, many individuals have been tested, such as boxing great Roy Jones Jr., who was always examined before he moved up in any weight class and before he became the heavyweight champion of the world. 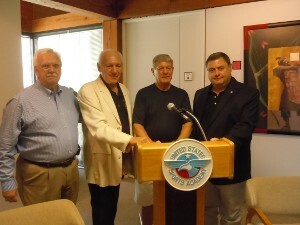 Pictured from left to right are Mobile Sports Authority Director Bud Ratliff, Academy President and CEO Dr. Thomas P. Rosandich, Gary Richards, a USA Boxing Board of Directors member and Academy Vice President Dr. T.J. Rosandich during an Olympic boxing delegation tour of the American Sport Art Museum and Archives collection of boxing art Aug. 6 on the campus. Holyfield, a 1984 Olympic medalist and five-time heavyweight boxing champion of the world, spoke at the Champions Banquet that featured all 10 trial champions. The group will now attempt to qualify for 2012 London Olympics at the World Championships in Baku, Azerbaijan in September. The 10 trial champions were: Eros Correa (San Jose, Calif); Rau’shee Warren (Cincinnati, Ohio); Joseph Diaz Jr. (El Monte, Calif.); Jose Ramirez (Avenal, Calif.); Jamel Herring (Coram, N.Y.); Errol Spence (Desoto, Texas); Jesse Hart (Philadelphia, Pa.); Marcus Browne (Staten Island, N.Y.); Michael Hunter (Las Vegas, Nev.); and Lenroy Thompson (Lenexa, Kansas).